 Industrial Clutch Parts Ltd. supply a complete range of Eaton Airflex Expanding Clutches & Brakes. The drum style products expand radially outward when pressure is applied, forcing friction shoes against an inner cylindrical drum surface. Eaton Airflex EB element has been designed to easily manage clutch and brake operations for light starting loads. Used as slip clutches and tension brakes for lighter torque and horsepower applications. Eaton's Expanding Clutches & Brakes maximize performance in braking and tensioning applications. EB Type units come in a range of sizes with a rugged, tire-like neoprene and cord tube that expands radially, forcing a friction surface against an inner drum to create stopping torque. Eaton's EB units expand, allowing them to behave as centrifugal clutches. They exhibit the same torsional resilient principle made possible by transmitting power through the sidewalls of the neoprene and cord actuating tube, which is so flexible it even permits minor shaft misalignment. EB elements are suited to slow speed applications having moderate starting and stopping loads. They are used as slip clutches and tension brakes for lighter torque and horsepower applications. Best suited for applications such as Centrifuges, Core Expanders, Laundry Machines, Textile Machines, and Tire Building Machines.